Mayor Daley on Friday created a commission drawn from labor, business and banking to confront a problem that threatens to choke future generations of Chicago taxpayers: underfunded city pension funds. The comprehensive solution Daley is seeking within 18 months could include everything from benefit reductions and increased employee contributions to a shift away from “defined benefit” pension plans and toward the “defined contributions” or 401-K plans favored by private industry. The city could raise the age for new employees to become eligible for full pension, as the CTA has done. If union leaders agree to make sacrifices, half the net proceeds from the proposed privatizing of Midway Airport could be pumped into the pension funds, under legislation approved by the Illinois General Assembly. The only thing certain is that something’s got to give. The city’s four pension funds alone have $10 billion in unfunded liabilities to employees and retirees. If they run out of money, Chicago taxpayers get stuck with the tab. “They need to reduce the benefits. They need increased contributions by employees and… benefits more in line with what’s offered in the private sector,” said Civic Federation President Laurence Msall. The 32-member commission that will confront the pension fund crisis at the city, Park District, CTA, CHA, City Colleges and Chicago Public Schools will be co-chaired by Daley’s Chief Financial Officer Paul Volpe and by Volpe’s predecessor, Dana Levenson, who now serves as head of North American Infrastructure for the Royal Bank of Scotland. “There are no easy answers,” Levenson said. At the end of 2006, the firefighters pension fund had assets on hand to meet just 40 percent of its liabilities. The ratio was 49 percent for police, 67 percent for municipal employees and 92 percent for laborers. Fraternal Order of Police President Mark Donahue questioned why the city’s two largest unions — police and fire — were not represented on the 32-member commission. Donahue said his members are “realistic” and willing to consider increased contributions. But the FOP president said he would insist on maintaining defined benefits. And he rejected the widely held belief that pensions for city employees who get sharply reduced Social Security benefits are overly generous. “Public service employees deserve better because of the sacrifice and commitment they make to the communities they serve. That’s the trade-off. There are more opportunities in the private industry for advancement and greater wage earning,” he said. Last year, pension obligations cost the city $475 million — more than 15 percent of Chicago’s corporate budget. The Chicago crisis mirrors the pension dilemma facing government agencies and private companies across the nation. Levenson sounded the alarm about the pension crisis in June 2006, but his call for a dialogue with city unions went nowhere. At the time, Chicago Federation of Labor President Dennis Gannon reminded top mayoral aides of what happened in 1997, when the city robbed Peter to pay Paul — and made the pension problem worse. With union consent, City Hall reduced its contribution to the well-funded Laborers and Municipal Employees pension funds and funneled $20 million of that money into the underfunded police and firefighters pension funds. The landmark deal also paved the way for a $20 million property tax cut and $200 million worth of neighborhood improvements. “I read ’em the riot act. I said, ‘You came to us 10 years ago and we gave you relief.’ We saved them hundreds of millions of dollars. They took money out of two good funds and gave it to police and fire. Now, they’re saying those two good funds are in the same mess. 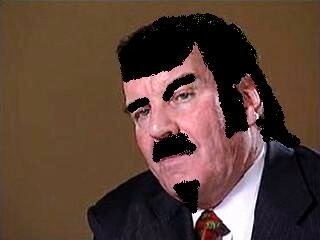 And I reminded them that early retirement [which made the problem worse] was their idea,” Gannon said then. Great, Mayor Daley and his family will find a way to steal more pension money, said Patrick McDonough. Photo edited by Patrick McDonough. This is a picture of Carl Segvich and Paul. 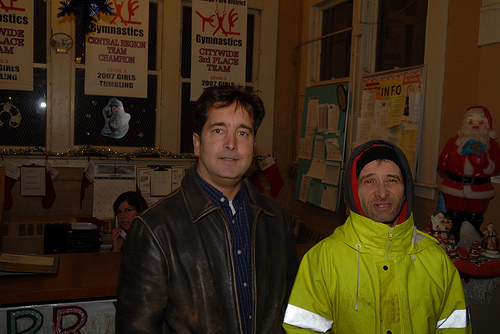 These men want to know why John Daley’s 11th Ward calenders are still hung on the walls of Chicago Public Property. Carl is running for Republican Committeemen in Chicago’s 11th Ward. The Daley Boys are not very good looking, but they know politics. Remember this post Mr. Inspector General http://www.chicagoclout.com/weblog/archives/2007/07/armour_park_square_park_chicag.html Photo by Patrick McDonough. Today I had the pleasure of meeting the owner of a fine Irish business. 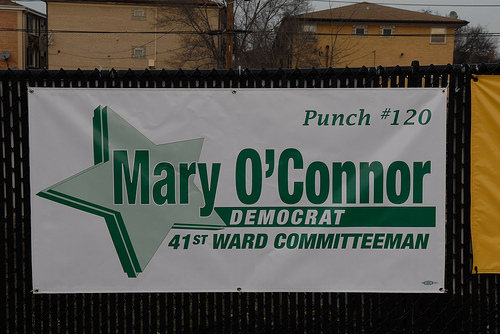 Mary O’Connor is running for 41st Ward Committeeman in Chicago. I have been to her establishment many times when I worked for the City of Chicago Department of Water Management in the North District. The O’Connor’s have a great work ethic. Mary is a very important part of the 41st Ward. She is committed to Chicago City Workers. There seems to be much tension in the race. I left a check to help achieve her goal. Her opponent has not contacted me. Good Luck Mary. Please go to her website http://www.votemaryoconnor.com Photo by Patrick McDonough. Mayor Daley&apos;s corruption-fighting inspector general fired one of his own employees Friday, six days after the $77,784-a-year assistant chief investigator was arrested for allegedly shoplifting at a Chicago grocery. Fourteen-year veteran investigator Tracy Buckley was charged Jan. 5 with misdemeanor theft after Whole Foods employees watched her walk out of a store at 6020 N. Cicero with $131.43 worth of unpaid items, officials said. Before deciding Buckley&apos;s fate, Inspector General David Hoffman said he conducted interviews, read reports and viewed tape recordings made by Whole Foods security cameras. They reportedly showed Buckley walking through several aisles of the store, past a bank of cashiers and into an elevator leading to an underground parking lot without paying for a shopping cart full of food. Stolen items allegedly included a $44.84 boneless lamb stew and pork chops worth $21.17. Buckley could not be reached for comment. She allegedly told police she was going to her car to get a different charge card that she intended to use upon returning to the store to pay for the items. Hoffman apparently didn&apos;t buy it — and he didn&apos;t wait for the outcome of her criminal case. "All city employees should be held to high standards of integrity, but these standards must be especially high for higher-ranking and prominent city officials. This higher standard definitely applies to employees of the inspector general&apos;s office," Hoffman said in a prepared statement. "Since our office is the city office that investigates city employees and makes disciplinary recommendations to city departments, it is especially important that the employees of this office be held to a very high standard regarding their conduct." Buckley is scheduled to appear in court Feb. 25. CHICAGO — Tracy Buckley, 36, a female employee of the Chicago Office of the Inspector General was charged with theft from a Northwest Side grocery store Saturday afternoon. About 12:55 p.m. she allegedly stole items from a Whole Foods Market grocery store at 6020 N. Cicero Ave., according to police News Affairs Director Monique Bond. Buckley is charged with misdemeanor retail theft for apparently stealing grocery items from the store, Bond said. Inspector General David Hoffman confirms the suspect is Buckley. Buckley has worked for the Inspector General’s office since Jan. 18, 1994. As of January 2006, Buckley was a supervising investigator with the office. Further details are not available, according to Bond. The City of Chicago&apos;s office of the inspector general is currently investigating one of its own investigators. Chicago police say Tracy Buckley, an assistant chief investigator for Inspector General David Hoffman, was arrested over the weekend on shoplifting charges. Officers say Buckley, who earns about $70,000 a year, was allegedly caught walking out with unpaid grocery items from a Whole Foods Market on the city&apos;s northwest side. Hoffman has placed Buckley on administrative leave, but he says he wouldn&apos;t be surprised if it turned out that the allegations against her were a mistake. Instead of examining other city agencies, the City of Chicago&apos;s office of the inspector general will be investigating one of its own. Tracy Buckley, an assistant chief investigator for Inspector General David Hoffman, was arrested Saturday on charges of shoplifting, police said. Buckley, who earns about $70,000 annually, according to 2006 city data, was allegedly caught walking out with unpaid items from a Whole Foods Market at 6020 N. Cicero. "I was notified by the Police Department," Hoffman said. "I placed her on administrative leave. I wouldn&apos;t be surprised if it was a mistake. We&apos;re going to look into it." Whole Foods employees allegedly saw Buckley, of the Northwest Side, walk past several aisles and enter an elevator without paying. She tried to steal about $100 worth of merchandise and was charged with misdemeanor retail theft, police said. "We have a parking garage below us. Once you&apos;re in the elevator, the only place you&apos;re going is the garage," a Whole Foods manager said. "The elevator is right by the exit door. It&apos;s the same as if they were going out the front door." Efforts to reach Buckley, 36, were unsuccessful. Buckley has been employed by the inspector general&apos;s office since 1994. Hoffman said he placed her on administrative leave, meaning she will be paid "at first" but not working while the department sorts out the matter. Hoffman said this is the first incident of this kind since his appointment in 2005. "She&apos;s kind of a senior investigator," Hoffman said. "I think we need to look into the matter more." Is Mr. Hoffman being fair regarding Tracy Buckley? VICTOR CROWN GAINS LEGAL STANDING ON WHISTLEBLOWER CLAIMS Chief US District Judge James Holderman has entered a federal court order which will permit Mr. Victor M. Crown to bring a motion after June 13, 2008 and unseal certifications that will exonerate MS. MIRIAM SANTOS and order payment of qui tam funds from the STATE OFILLINOIS. The written material and certifications submitted under the federal False Claims Act and the Illinois Whistle blower Reward and Protection Act include time sheets from the Office of City Comptroller negating Counts 6 and 7 relating to a false claim applied to political work on city time and records obtained under court order from the City of Chicago Board of Ethics negating each of the other 10 counts in the original indictment.. The federal court order by the Chief Judge in the Northern District represents a major defeat for the Daley administration [and the City of Chicago] since it previously argued in 2005 and 2006 that Mr. Crown didn&apos;t have the legal standing to gain compensation relating to whistle-blowing activities and a false arrest from 1996 by the City of Park Ridge police department.. Victor Crown has now earned a major legal victory against the Office of Corporation Counsel. I like Victor Crown and I hope he keeps moving forward against Chicago Corruption. Patrick McDonough.